Yesterday I brought with me the Hnefatafl game to a family birthday party. All the guests were very unaquainted with Hnefatafl, only four or five even ever heard about it. 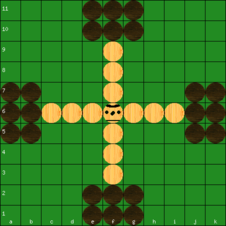 I invited three of the guests for a game of Hnefatafl and decided to use the Tawlbwrdd 11x11 variant (Tawlbwrdd Lewis cross). This is a very efficient game in company with beginners, the simplest tafl game ever! Even simpler than Sea battle tafl. All squares are alike, there are no special squares on the board. All pieces are alike, the king is no different from any other piece, it's just that one of the pieces (the king) has to make it to any board edge square. Any piece is captured this way (show a custodian capture). That's all, very simple to explain to a beginner and simple to play. The game works very well, the game balance is till now measured to a fine -1.06 (106 black wins per 100 white wins). when white, pieces f3 and f9, and perhaps c6 and i6 etc. when black, pieces f1, f11, a6 and k6, or perhaps e2, g2, e10, g10, b5, b7, j5 and j7, etc. And despite the removed pieces, the game still works well against a beginner. Last edited by Hagbard on Sun May 15, 2016 9:37 am, edited 1 time in total. Hagbard wrote: Yesterday I brought with me the Hnefatafl game to a family birthday party... I invited three of the guests for a game of Hnefatafl and decided to use the Tawlbwrdd 11x11 variant (Tawlbwrdd Lewis cross, Welsh tafl). ... This is a very efficient game in company with beginners, the simplest tafl game ever! Even simpler than Sea battle tafl. Great story Hagbard - you're right, it is a really simple variant - no special squares, no special pieces. Good place to start with beginners. Did they enjoy the games? Do you think they'll play again? By the way, I had a lesson from a genuine Welsh friend on pronunciation, and she pronounced Tawlbwrdd as "towel - boorth"
crust wrote: Did they enjoy the games? Do you think they'll play again? They did enjoy the games, and so did I. They were immediately ready to play the game and without having to think much about the rules. Not like earlier times when I with other beginners tried Skalk 11x11, Fetlar 11x11, Tablut 11x11 (Fetlar setup with throne) or Saami 9x9. With those games, the beginners were a bit confused and struggled to remember the rules details. They were amused by the simple Welsh tafl and won't be hard to persuade for a game again. Two of them were children 12 years, who also immediately played this variant with no problem. crust wrote: By the way, I had a lesson from a genuine Welsh friend on pronunciation, and she pronounced Tawlbwrdd as "towel - boorth"
Interesting! It would be pronounced like that, it's clearly the simple Scandinavian word "Tavlbord", old Danish "Tauelbord", old Norse "Taflborth". "D" easily and often becomes "th". The word names the game board and also the game played on it. Last edited by Hagbard on Mon Apr 30, 2018 8:14 pm, edited 1 time in total. Tawlbwrdd is often the first version of the game that I teach people. It's the simplest and purest version, and I'm glad that it works so well. Of course I'm yet to find out if the absence of a special central square is historic or not. Tawlbwrdd throneless Lewis cross 11x11. It was a great success with the children, two children 5 and 6 years old fast got a grasp of the game. Even a child 2 years old understood how to move the pieces. And two children 10 and 14 years old had many good games and much fun. At other family birthdays I've earlier invited an elderly gentleman to play tafl but used other variants with more complex rules. We met about once per year, he found the game complex and now refuses to try it anymore. So, for children and for people unfamiliar with tafl, the "Tawlbwrdd throneless Lewis cross 11x11" is much to recommend to give them a good experience with the game! February 2018 Hnefatafl was presented as one of the games at a Classic Board Game café. The other games were Checkers, Frisian Checkers, Nine Men's Morris, Othello (Reversi), 9x9 Go and Trax. Present were our National Junior Champion of Othello and masters of Checkers, Go and Trax, and I for Hnefatafl. The guests at the café never met Hnefatafl before and never even heard of the game. Yet again the tafl variant "Tawlbwrdd throneless 11x11" (Lewis cross setup) proved effective for presenting tafl to beginners. Both adults and children grasped the rules immediately, despite meeting them for the first time, and was able to use them straight away and enjoy some fun games. Noone had problems with this game and they found it thrilling, and even more because of its historical background and the viking pieces. Adam's plate with the Historical Hnefatafl rules, which are the same only adding a throne, was given to the interested guests. October 2018 Hnefatafl was again presented at the Classic Board Game café. The other games were this time Daldøs, Trax, Nine Men's Morris, Othello (Reversi), 9x9 Go, Kalaha, Wari/Awalé/Oware, Quoridor, Checkers, Frisian Checkers and Catch The Lion. This time the Saami Tablut (Historical Hnefatafl 9x9) was used and worked well for the guests. The proper Tablut rules were used, with one simplification: friendly throne instead of hostile. November 2018 I brought the tafl game to the Nordic Game Day, but unfortunately there seemed to be little interest for the classic board game, as the guests concentrated only on "modern board game" style games. February 2019 Hnefatafl (Saami Tablut 9x9) was again presented at the Classic Board Game café. The other games were Checkers, Frisian Checkers, Nine Men's Morris, Othello (Reversi), Go (9x9), Trax, Daldøs and Sáhkku, Shogi and the simpler version Catch The Lion, Quoridor, Pentomino, Hex, Havannah, Twixt, Lines of Action, Atoll, Wings, Gonnect, Menara and dice building games, Pentalath and Yavalath, Kalaha and Wari/Awalé/Oware. The 9x9 Tablut boards are cut from the bottom of strong paperboard fruit boxes from the super market. The pieces are from a Go set, the kings are from a checkers set.